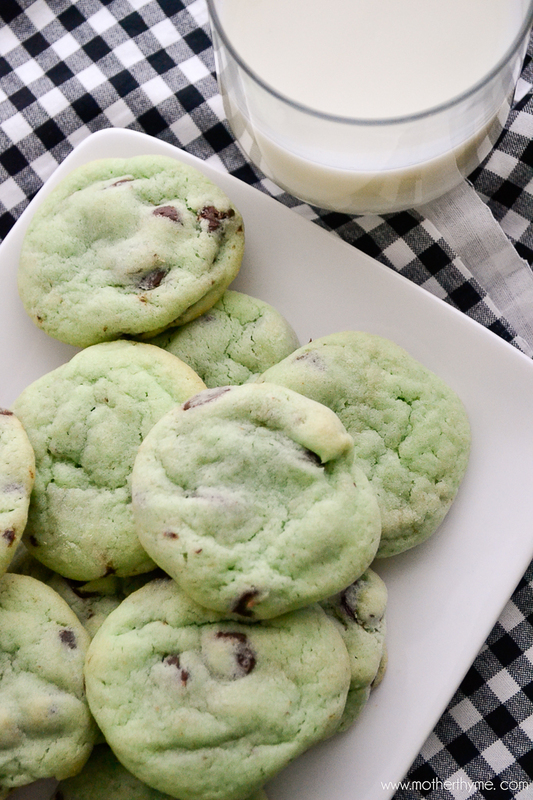 Soft and chewy Mint Chocolate Chip Cookies, perfect with a tall glass of cold milk! Chocolate Chip Cookies are my absolute favorite! A plate of Chocolate Chip Cookies and a tall glass of milk, I’m a happy mommy. Another favorite of mine is Mint Chocolate Chip Ice Cream. 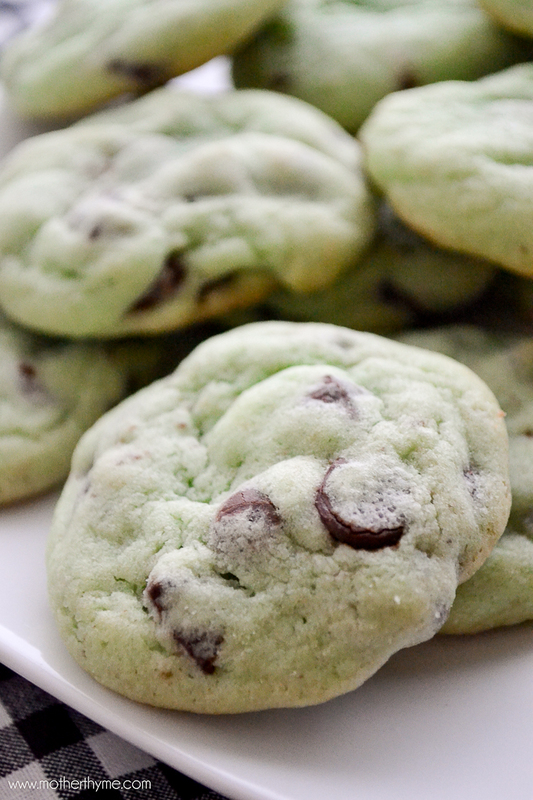 Combining my two favorites into one soft Mint Chocolate Chip Cookie is the perfect match. My holiday cookie tray wouldn’t be complete without these cookies, they are always a hit. It is hard to resist these perfect Chocolate Chip Cookies with a hint of mint. The addition of the green makes them festive for the holidays. I usually use semi-sweet chocolate chips but I have used chocolate chunks as well. When it comes to Chocolate Chip Cookies, since the chips are such a key ingredient to the quality of the cookie, using good quality chocolate chips is essential. It really makes a difference. If you love chocolate mint desserts as much as I do, another holiday favorite is my Chocolate Mint Pudding Poke Cake. Miss a week of the 2013 Countdown to Christmas Cookies? Using an electric mixer cream butter and sugar. Add in eggs, peppermint extract and food coloring until blended. In a medium bowl stir flour, baking soda and salt. Gradually stir into butter mixture. Make tablespoon size balls and place on baking sheet. Bake for 9-10 minutes until bottoms is just brown, don't over bake. Cool on baking sheet for about 5 minutes until transferring to wire rack to cool completely. We are crazy for mint over here, these are going to be favorites for sure! Jen those are two of my favourite things too although I think mint chocolate chip ice-cream is pretty close to the top. Sounds like the perfect combo to me. 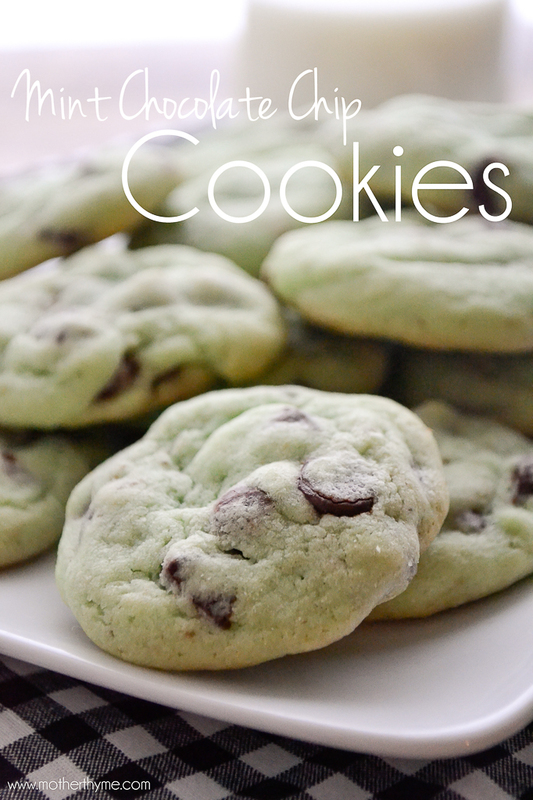 I love anything mint chocolate, wonderful holiday cookie idea! Made these and they are delicious but the instructions never say when to add the food coloring and since I wasn’t thinking about it I never added it. When do you add the food coloring? Hi Tricia, So sorry that was left out of the recipe. The recipe has now been updated. These cookies didnt taste very good. We tried making them at home with all the correct ingredients and it didnt come out proprerly. I tried making these cookies and I followed the exact recipe and did what it told me to do. Although I did all of that the cookies turned out flat and under baked. I put the cookies in for the amount that I was told but cookies still didn’t turn out correctly. These are delicious. I made them for my sister’s baby shower and everyone loved them. They were gone within minutes. Yummy cookies! I would say go with 10 or 12 drops of peppermint extract.